A New Hampshire lawmaker is looking to bring back smoking in your favorite bars and restaurants. The measure is meeting some heavy opposition. 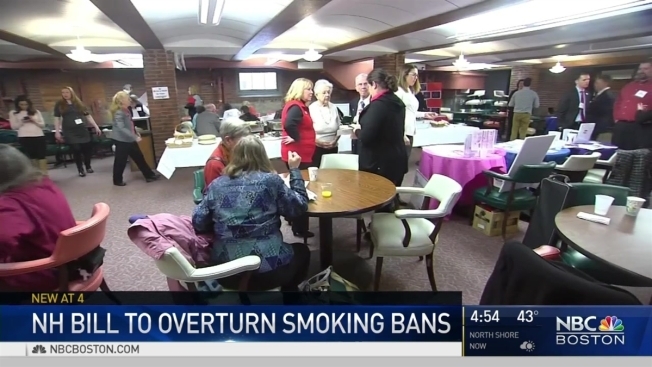 If passed, the bill would allow smoking in privately run establishments like the Barley House in Concord, New Hampshire. People dining there Thursday afternoon said they were enjoying their lunch with a side of fresh air. “My wife is pregnant and we like going out to restaurants like this and I don’t think we would, it definitely wouldn’t be a good idea,” said Tom Chesnard of Concord. The Barley House Manager Kevin Graham told NBC Boston the restaurant went smoke free even before it became a law a decade ago. “It definitely helped business and the overall working environment for our employees,” Graham said. But the bill’s author says it’s a matter of property rights. Rep. Robert Hull says it should be up to owners of private establishments to decide whether or not smoking is allowed inside. Hull didn’t answer our calls or emails Thursday, and didn’t attend a breakfast hosted by cancer survivors at the State House. “I was a smoker, I smoked for 40 years,” said Jim Cartwright. He gave up cigarettes the day he was diagnosed with lung cancer ten years ago and he wants lawmakers to hear his opinion. “This is the most insane piece of legislation that anybody has introduced in 20 years,” Cartwright said. There’s no timeline on when lawmakers will vote on the bill, but if passed, The Barley House promises to stay smoke free.